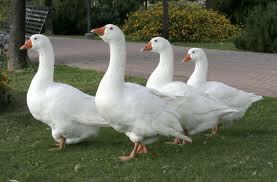 My Dad used to live next to a bit of common land where a gorgeous flock of white geese used to hang out. The day before half of them were slaughtered for christmas tables, they all went really really spookily quiet. They stopped cackling all day and just stood stock still…they knew their fate before it happened. Poor old geese.